I really have to give it up to the guys over @OMExtracts for their quality lately, and this Headband Gold Label was another brain stopper. Visually speaking this stuff looks like bright fish eggs, and when you easily pull away exactly how much you’re looking for, you’ll enjoy the sticky crunch consistency. As usual I went for a low temp flavor dab first, and the flavor was a little on the light side, but definitely got that Headband lemon flavor. Second dab I went in for the kill, and it was executed. I do have to say it was a little on the harsh side, but I immediately got the “Headband” feeling around the top of my head, and had a decently long lasting experience for me. So if you’re looking for some stylish new headwear, I think the OM Extracts Headband Gold Label will look nicely on you. Thanks, Steve! Substance is super excited about limited recreational sales of extracts starting on June 2nd. Recreational marijuana users will be allowed to purchase 1g of CO2 or BHO extract per day. Start making your wish list today! 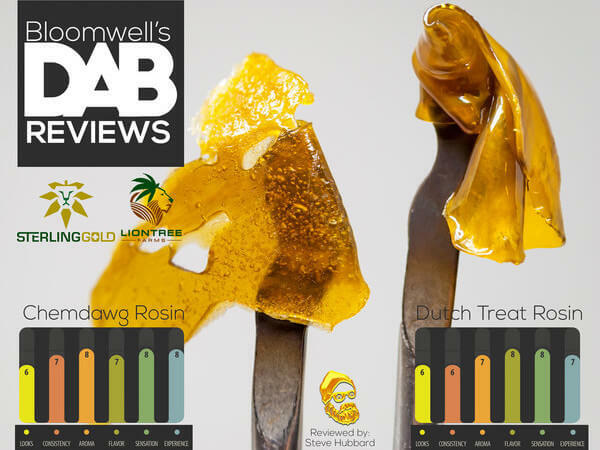 Sterling Gold’s Rosin is the first Flower Rosins (SHO) I’ve personally had the pleasure of trying, and they were delightful! I’ll admit, I was one of the skeptics in the group about people using hair straighteners for science. But now with the industrial presses we are seeing around, I see the light! The looks of these two really speak for themselves, and the smell matches the flowers amazingly! That was my first big surprise with this rosin, the smell literally smacks you across the face. The consistency of both were very manageable. I would even say you could use your hands, but I was pulling and snapping with my dab tool. The second surprise with these Rosins was the flavor. Simply put, it’s delicious! Reminds me of fresh “greens” from some sweet chronic back in the day. I think we all remember our first, fresh delicious “greens” rip? Along with amazing flavor, these rips were super smooth. Easy to puff tough and not kill yourself. Even higher temp nail rips weren’t bad, so that’s a real win in my book. This week I was very excited to review one of my personal favorite processors, Sterling Gold Extracts. They are the in-house extraction team of Liontree Farms in Southern Oregon, and these guys know what they are doing. When it comes to quality and consistency with their products, Sterling Gold Extracts hits the mark every time. Charlotte’s Webbing Cake has a great 2:1 THC:CBD ratio with 44.8% THC and 23.2% CBD, beautiful color and clarity and a sweetness to the aroma. As expected with a higher CBD content, the consistency is a bit on the sap side, but on a cold morning it pulled and snapped just fine for me. First dab I went with a nice low-temp nail for flavor. The sweetness and CBD mint combination was delightful, the taste of cake really does come to the palate. Second dab as usual, I went in for the big “Steve Size” dab to see what Charlotte had for me. With that nice 2:1 ratio, the inhale is really nice and smooth even on a higher temp nail, and the experience was just as smooth. This concentrate really clears the mind in a soft and soothing manner. There was a perfect balance of effects to the head and body and I kept thinking how refreshed I felt with each dab. This would be great concentrate for anytime of day and for all levels of users. I don’t normally crash weddings, but I’d crash Charlotte’s party for some cake any day. The goal was to ensure legal marijuana businesses, like growers and sellers of legal recreational pot could operate in the City of Bend, Oregon for years to come. Substance founder — or “Person Responsible for the Facility” if you want to get technical — Jeremy Kwit has spent months in meetings as part of the City of Bend Marijuana Technical Advisory Committee. The nine-member panel included a diverse representation of Bend’s cannabis industry, community activists and concerned citizens. The City of Bend Marijuana Committee crafted a set of very balanced planning code changes, municipal regulations, and an operating license program for the entire marijuana industry — producers (growers), processors (hash and edible makers), wholesalers, retail pot stores, analytical labs — with the city limits. Commercial marijuana cultivation will be licensed in Industrial Zones. The processing of marijuana concentrates into butane hash oil or CO2 vape pen cartridges can be dangerous because of flammable solvents or high pressure extraction machines involved. Such potentially dangerous processors will also have to locate in an Industrial Zone. Recreational pot shops and edible makers can operate in Commercial Zones, but not in Residential or Industrial Zones. The Planning Department approved the Marijuana Committee’s zoning suggestions and so did the City Council. For cannabis retail establishments (which sounds way fancier than recreational pot shop, doesn’t it?) the Technical Advisory Committee proposed a 150 ft buffer from daycare facilities. The Marijuana Committee researched and considered park buffers, but ultimately did not feel a buffer was necessary from parks since Bend law enforcement hasn’t seen any increase in marijuana activity in parks, and our parks already have police coverage. The Committee did not propose any buffers between retail facilities, falling in line with Measure 91 and 3400. Personally, Jeremy Kwit, along with many others, thinks buffers are unnecessary, and feels (based on empirical research and data) that open, honest dialogue with our youth about alcohol and drugs is the best mechanism to keep them safe and sober. It seemed rather hypocritical to keep an legal marijuana stores many blocks away from a park when alcohol is sold INSIDE our parks in Bend. In fact, the Bend Parks and Recreational District applied for and attained an OLCC license to sell alcohol at the Simpson Ice Pavilion — get drunk, place metal blades on your feet, zoom around ice, then drive kids home. Every issue was discussed thoroughly and debated aggressively by the Bend Marijuana Committee. There was no unanimity, and Marijuana Committee’s internal votes about every detail were frequently 5:4 or 4:5, in nearly every instance. All members of the Marijuana Committee were concerned about youth access to alcohol, tobacco and other harmful drugs; they disagreed on the best method to educate and create a culture of trust and communication about alcohol, tobacco and other drugs. The City Council reviewed and discussed the City of Bend Marijuana Technical Advisory Committee’s findings in a work session until 11pm one night, and then during a City Council meeting that lasted until 1am another night. The two members of the technical committee who claimed that retail density leads to increased youth access and drug abuse presented spurious alcohol and tobacco research to the Council, striking fear into the hearts of our elected officials. When all was said and done, the City Council added a 150 ft park buffer and a 1000 ft buffer between individual cannabis retailers. It’s a pretty good set of regulations overall, although nobody was really pleased. Opt-outs and egregious over-regulation are just prohibition in disguise. Amendments to our Planning Code and a marijuana business Operations License ensures that the entire cannabis industry will legally operate in Bend for the long term. It’s an exciting time in Central Oregon! Please show your support for allowing recreational marijuana businesses in Deschutes County by attending one of these local meetings. These meetings are open to the public. Attendees are expected to be professional and respectful in behavior and appearance. Come to a hearing and see what’s up with the recreational marijuana legislation in Deschutes County. Recreational Marijuana: It’s the marijuana you DO take home to mom. I mean, only take weed home to your mom if she’s into that sort of thing. Well, it finally happened. The seventh seal was broken, the words were spoken, and that one-time innocuous weed that the devil planted so long ago was finally let loose onto the public last month. Oh, the horror, the horror. Release the Ganja! The Sticky Icky! Seriously, though. It’s all a bit silly now, isn’t it? Of course, those dangerous and dirty pot heads who’ve been ignoring those ridiculous prohibition laws this whole time knew that the overblown War on Drugs was, and still is, nonsense. Thankfully, sanity has started to take a more active role in our little ole US of A–even if it is only one state at a time. For the old stoners and the virgin recreational marijuana users — we like to say “adult consumers” around here— let’s forgo all the data and science and research regarding the medical benefits of cannabis, forget about politics, and let’s just share our marijuana experiences with our fellow humans. Here at Substance, we aren’t about selling you a product to put money in our pocket; we’re about sharing our knowledge and experiences. We want you to have a good time. Come in today and see what we have to offer. Come back tomorrow. Tell your friends about us. Tell us what you like and try a new strain. Just walk in and buy yourself some pot – really good pot – and finally enjoy it without being paranoid about the fuzz. What do you like to do after a bowl (or two)? Heck Yeah, We Do Sell Recreational Marijuana Here! Gone are the days of, “Pssst! Hey, do you know where we can score some pot?” It is now legal for participating Oregon Medical Marijuana Dispensaries to sell marijuana to adults who are 21 or over. That’s right, folks, you can all (21 and over) come in to Substance and buy marijuana from us, legally. For real. No code words or secret handshakes are necessary. You know what makes us extra awesome? We accept credit and debit cards, so you don’t even need to drive by the ATM first. Oregon Recreational Marijuana law states that we may sell up to 7 grams – 1/4 ounce – of flower per day to someone who is at least 21 years old. We also have seed packets available and a list of clones that are available to pre-order. Due to the high demand of our client base, we rotate through a variety of marijuana flowers –buds – and our selection is always changing. Flower is packaged in 1 gram, 3.5 gram, and 7 gram bags and we have a wide selection of pre-rolled joints available. We also carry a selection of pipes, grinders, lighters, and other non-medicated items. Oregon Medical Marijuana Program (OMMP) cardholders have their own sales island and are allowed to purchase all of our flower products as well as our tinctures, edibles, concentrates, oils, candy and beverages. Unfortunately, those products will not be available for the recreational users until the end of 2016 due to pending legislation. We highly recommend you obtain your medical card to have access to all of our delicious products. Please be respectful and don’t spark it up in our parking lot. Recreational or Adult Use, Marijuana or Cannabis: Which Term to Use? If you’ve ever been to a dispensary, you might have noticed some slightly different language to refer to the products and services inside than you have heard colloquially or in the popular media. In this post, we give a brief breakdown of why we use the language that we do. With legalization in Colorado and Washington, and now in Oregon as well, you’ve probably heard the term “recreational marijuana” to refer to cannabis use outside of medical marijuana programs. Here at Substance, we refer to cannabis usage for adults over the age of 21 who do not hold Oregon Medical Marijuana Program (OMMP) cards as “adult use”. We use this term because we believe that responsible adults can and should be able to determine what cannabis usage means to them. The medical vs. recreational binary creates a false choice for cannabis users, reinforcing the idea that non-medical users of cannabis are making inherently risky or reckless decisions. Sensible, adult cannabis users who do not have qualifying conditions for the Oregon Medical Marijuana Program should face no more stigma than adult users of alcohol. Adult beer drinkers, by comparison, do not have to go to the ‘recreational beer store’. Cannabis and marijuana essentially refer to the same thing. Technically, cannabis refers to the parent plant, which can be broken up into Cannabis sativa, Cannabis indica, and Cannabis ruderalis. Sativas and indicas are what we seek on the medical and adult use markets – ruderalis lacks the cannabinoids that provide those sought-after therapeutic benefits. Hemp is used to refer to a low-THC variety of Cannabis sativa that is often harvested for industrial use. Marijuana is generally used to refer to higher THC (or CBD) varieties of Cannabis sativa and Cannabis indica. However, the term has not always been so commonplace. Widespread usage of the word ‘marijuana’ began following the Mexican Revolution of 1910, when the United States saw a large influx of Mexican migrants. Many of these migrants used cannabis as a medicine and a relaxant, and as anti-Mexican sentiment went on the rise, racist propaganda spread fear of the Mexican “Marijuana Menace”. Because of the history of racism associated with the term ‘marijuana’ in the United States, and the general applicability of the term ‘cannabis’, we use the latter. Considering this history, and the stigmas still surrounding cannabis use today, we feel that using the term ‘adult cannabis use’ over ‘recreational marijuana’ helps combat the negative associations that we as a society have with the cannabis plant. We hope this post has been informative. Thanks for reading, and we look forward to seeing even more of you join our community of adult cannabis users come October 1st! As of October 1st, 2015, Oregon’s medical marijuana dispensaries may choose to begin selling marijuana for adult (recreational) use to persons who are at least 21 years of age, under the regulation of the Oregon Health Authority (OHA). Here are some important snippets of information to learn and share with your friends. A valid government issued photo ID showing name and date of birth is required. Only the date of birth of the purchaser is recorded to maintain compliance with the OHA. Current OHA-licensed medical marijuana dispensaries may choose to sell to adults 21+ along with OMMP cardholders. Recreational marijuana stores licensed by the OLCC will not be open for business until fall of 2016 at the earliest. It is legal to purchase cannabis from a state-licensed medical marijuana dispensary. Adults 21+ may purchase up to 7 grams (¼ oz) of marijuana (pot, weed, bud, flower) each day. Adults may also purchase up to 4 immature marijuana plants (clones) and seeds per day. Medical marijuana cardholders can still purchase all cannabis products that are available, including hash oil concentrates, edibles, tincture and topicals. Where can we consume it? Consume marijuana on private property, presumably out of public view. Where should we keep it? Don’t keep an open container of marijuana in your vehicle; keep it locked safely in your trunk. Consider obtaining a lock box to keep children and pets safe. Remember that marijuana bud is a perishable product so keep amounts to a minimum to ensure freshness. Why should I renew my OMMP card? Most medicated items — hash oil concentrates, edibles, tinctures and topicals — are only available for medical marijuana card holders. You may be missing out on many amazing new products if you don’t renew your medical marijuana card! How do I get a medical marijuana card? We have copies of the OHA paperwork available in our lobby, and the State of Oregon has created detailed handbook PDF that is available to download and print. Call Substance for the most up-to-date information and current lists of OMMP doctors. Recently we at Substance started carrying a new flower, known as Afghani Pakistani, or Afpak for short. A couple of the staff members here have gotten a chance to try this lovely flower, and we would be delighted to share our experiences and opinions on it with you all. First things first…some basic Afghani Pakistani knowledge for your brains. My first impressions of the strain were very positive. It looks gorgeous, with beautiful purple coloration, prominent orange hairs and a decent bud structure. The Afghani Pakistani’s trichomes are abundant, making it look rather frosty and visually appealing. The smell is just as good, with a sweet candy-like aroma. In fact, I would best describe its appeal as being like “purple candy”. The bud was clearly cured very well. The flowers are not dry, nor are they full of moisture which would suggest it was harvested too early. Rather, the process appears to have gone very well and provides the flower with a lovely consistency. The texture is sticky and balanced just right. I loaded my pipe with the Afghani Pakistani flower as my day was winding down to an end. I was tucking in for the night, ready to relax and listen to some music. I was hoping that the strain would be perfect for such a setting, given that it is a heavy indica – and it was. The taste of the smoke was just as sweet, if not more so, than the flower itself. The resulting effect was a pleasant heady buzz that made me feel very relaxed and helped to ease my muscle tension. My coworker made an excellent observation about the strain. He stated that while the Afghani Pakistani is a heavy indica, it nevertheless produced a very functional high that didn’t have the “couch-lock” effect that many indica strains tend to induce. I experienced a similar effect – body and muscle relaxation, pain relief, while still being able to stay up and do creative things like drawing or making music. All in all, the Afghani Pakistani gets a rating of 9/10 from me. It’s a well formed flower with excellent appeal and a very pleasant effect. I would definitely recommend picking it up while we have it in the store, because it’s going fast.